During this year’s athenahealth UX retreat, the team came together for two days of intensive learning and laid-back camaraderie to power our commitment to redesigning healthcare. Colleagues in India converged on Bengaluru, while team members from Austin and Boston convened in our headquarters on the Charles River. That’s almost 100 people — UX researchers, designers, engineers, writers — fully focused on advancing the practices of user experience at athenahealth. During lunch on the first day, we hosted a panel of experts from athenahealth’s Onboarding, Client Support Center, Engagement, and Sales teams. 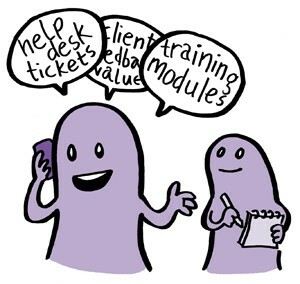 While many of us UXers speak with clients often, these folks do so all day, every day. 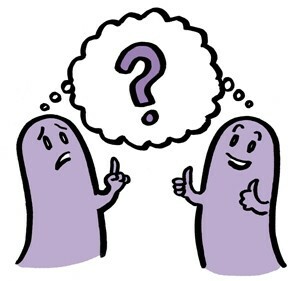 In many ways, they experience clients’ pain points right alongside them and they are knowledgeable advocates for current and potential users. The panelists shared perspectives on trends in clients’ requests and they validated the impact of recent redesign work on the quality of users’ experiences. No matter the size of your organization, you can deepen your understanding of users’ needs by speaking with the people to whom your clients turn for help. Building trust and communication between UX and both sales and client services makes it easier to dig into those needs and to understand the contexts within which they arise. People in client-facing roles are typically happy to have those conversations, particularly when they’re a light addition to existing work. Attend a client services team meeting. Listen to what they’re talking about and get to know the people who help clients solve problems in real-time. Check if your organization has Slack channels, intranet zones, or other areas where subject matter expert (SME) conversations already take place. They’re great for regular learning in bite-sized chunks and for getting quick answers to specific questions. 2. Create a centralized reference for users’ jobs and integrate it throughout research and design activities. athenahealth’s DesignOps team has researched and collated a comprehensive list of all the “jobs” people do to care for patients in a clinical setting (and to get paid for that care), based upon the jobs-to-be-done (JTBD) frameworks of Clayton Christensen and Anthony Ulwick. 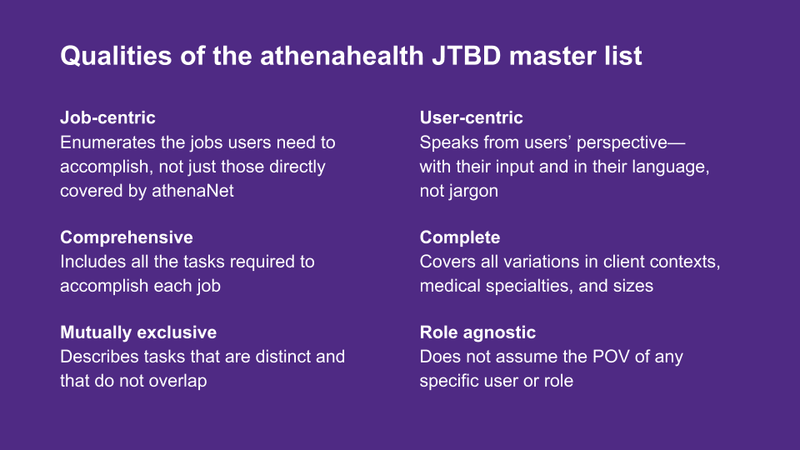 To create our JTBD master list, the team started with taxonomies from across athenahealth’s products and services. Then, clients vetted the list for completeness and to ensure jobs were worded from users’ perspective. Finally, athenahealth SMEs, UX designers and researchers, and product managers fine-tuned the list and added more detail. The result of this rigorous process was a MECE (mutually exclusive and collectively exhaustive) list of the jobs our users need to accomplish. New features are evaluated based upon their JTBD fit and user roles that need to be considered during design are easily identified. Quantifying jobs based upon how they satisfy users’ needs has helped us rationalize priorities clearly and persuasively. Teams can align their release planning to that prioritization and to other teams working on the same or related jobs. Our analytics team is tagging voice of the customer (VoC) feedback against JTBD so that we can quickly pull qualitative data focused on specific tasks and workflows. New surveys frame questions based upon individual or groups of jobs, which streamlines analysis of the answers. Evaluate and prioritize projects and features based upon the value of the jobs they support (i.e., user needs scoring). Label qualitative and quantitative research (like field research notes or survey data) using JTBD to streamline analysis and disambiguate discussions across the organization. 3. Plan Agile sprints that are focused on learning. 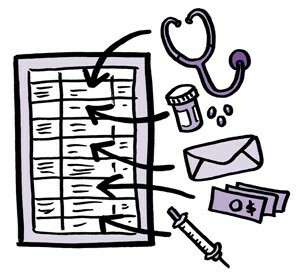 Healthcare providers use Epocrates, athenahealth’s medical reference app, to look up diagnostic, treatment, and safety information right in the moment of care. During their presentation at the retreat, the Epocrates team described how they approached a tough situation: What do you do when you have a big problem to solve and don’t know how to start? What if even just coming up with hypotheses (as you might do during a design sprint) feels impossible with the information you have? Faced mostly with unknown unknowns, the team decided to run several week-long learning sprints — quicker than our standard two-week dev sprints but more in-depth than a spike, which is usually a day or less. (If you’re not into Agile-speak, this simply means that they created a timeline to suit the goal rather than adhering to existing constraints.) The learning sprints were defined as broad but time-bounded exploration, and each had a stated purpose along the lines of “Find out more about ______.” Depending upon the area to be explored, the sprint team comprised a mix of UX, product, data and analytics, marketing, and architecture participants who met each day and kept in close contact over Slack or in person. While many of their learning sprints resulted in a clear hypothesis that could be tested, more surprising — and freeing — was the observation that some learning sprints resulted in a dead end. Given the initial blurry state of the problem, eliminating avenues of exploration brought a welcome focus to the team’s work. Explicitly permit time for broad research when your problem is amorphous. Reshape sprints or other scheduling practices to suit learning, rather than design or execution, and get the right people involved — often those who are adept at data analysis. Recognize and appreciate when a learning sprint doesn’t seem to unearth anything valuable. Identifying what is irrelevant will speed you toward definition of what is important. 4. (Bonus!) Understand your organization’s decision-making style. As a bonus fourth takeaway, let’s turn from defining users’ needs to learning more about ourselves and our ecosystems. One of our UX zone leads, Dani Nordin, taught retreat attendees about organizational decision-making styles and the benefits/limitations of each type. Take a look at her recommendations to understand your group’s style and how best to work within it to increase your design influence. Want to join a team committed to learning and to educating one another, all in service to our clients? We have a variety of design roles open in Boston, Austin, Bengaluru, Chennai, and Pune. If you’re interested in working with us try here and here or get in touch via LinkedIn, Twitter, etc.